Ex-CEO: Barclays Isn't The Only Bank At Fault "We have a profound issue — that is, an industry-wide issue, not just a Barclays issue," Robert Diamond told Parliament members Wednesday. The former head of Barclays Bank resigned Tuesday over a growing interest-rate manipulation scandal. 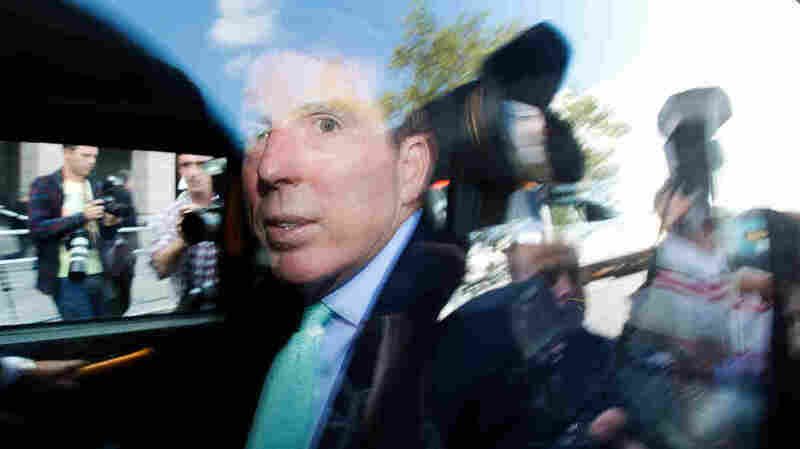 Former Barclays CEO Bob Diamond leaves Parliament amid a crowd of reporters in London on Wednesday. Diamond, who resigned Tuesday, was questioned about a growing interest-rate manipulation scandal. The fallen leader of Barclays Bank got on the hot seat before members of the British Parliament on Wednesday. Robert Diamond, an American, resigned Tuesday as CEO of the bank — the latest executive to lose his job over an interest-rate manipulation scandal. The scandal has not only consumed Barclays, it also threatens to engulf other international banks — and high-ranking government officials, too. Diamond started his career at Barclays on Independence Day, exactly 16 years ago. On Wednesday in London, he set off some fireworks all his own. "I love Barclays," he said. "History will judge Barclays as an incredible institution because of its people. We need to get through this period, and the best way to do that is for me to step down." Of course, recent history has not shed favorable light on the bank. At issue is LIBOR, short for the London Interbank Offered Rate. It's a key interest rate that affects the cost of consumer loans worldwide — and it's calculated daily, based on data submitted from various banks, including Barclays. Barclays has admitted some of its traders submitted falsified information in attempt to manipulate that rate so it could pad their profits. For this, last week Barclays agreed to pay a $450 million settlement to U.S. and U.K. regulators. In addition to Diamond, Barclays' Chairman Marcus Agius and Chief Operating Officer Jerry del Missier have also resigned. But these actions didn't mollify many members of the parliamentary panel. John Mann of the Labour Party demanded Diamond return his compensation and shares. "What are you going to do to put the record straight with your personal behavior?" Mann asked. "Because you personally are responsible, either by being complicit or by being incompetent." "Sir, as I said earlier, I accept responsibility and I also accept responsibility for the actions we've taken to correct the situation," Diamond answered. Diamond did not say he would give back his compensation. During the three-hour hearing, Diamond repeatedly alleged rate manipulation was a common practice among banks — and maintained Barclays is being singled out. "We have a profound issue — that is, an industry-wide issue, not just a Barclays issue — in terms of LIBOR submissions," he said. Barclays also released an email exchange from 2008 that appears to suggest an official at the Bank of England — the British central bank — was urging Barclays to lower its interest rate figures. That leaves many wondering whether government officials will soon be implicated in the growing scandal.